BLT’s Indirect Tax team, Liz Watt, Guy Barrand and Emma Wade, would like to congratulate Centurion VAT Services on their success in winning the Best VAT team award at the 2013 Tax awards. 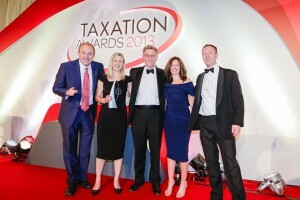 They were shortlisted against the tough opposition of KPMG and Deloitte and the team of five senior VAT experts were delighted that the judges recognised that Centurion “punched well above its weight” in terms of the support it provides to its clients. Well done to Centurion, and the other nominated teams, from all at BLT . Supporting Alderman Fiona Woolf CBE who is, subject to election, in line to be the second Lady Lord Mayor in the 1,100 year history of the City! “The Women in the Livery and City Float“ took part in this year’s Lord Mayor’s Show, on Saturday 9 November 2013. This was an initiative of the Women in the Livery Group of the City Livery Club that is supported by members of the Club as well as several women’s groups including City Women’s Network, International Women’s Forum UK, Women in Banking & Finance and Pan Asian Women’s Association. Also supporting the Float were several other business women in the City from organisations such as the IoD City of London branch and other City companies. BLT once again hosted an insightful and well received seminar on the topic of “Smart Talent Management and Business Performance”. Jill Foley, a Managing Partner at On3, was invited to present her seminar which detailed the virtues of an inventive and modern approach to talent management and the positive impact it can have on business performance. Drawing on her own practical experiences Jill highlighted how traditional approaches to talent management were failing to deliver enough talented individuals to prompt future success. BLT would like to sincerely thank everyone for attending and hope that you will return in the future! BLT will be a guest panel list at this gathering of business school advisers. Contact Don Leslie if you’d like to link up while we are there. A big well done to Boxwood and PwC whose projects were highly commended by the judging panel and a massive CONGRATULATIONS to the team at Challenge Consulting that won the award for their work with Hitachi Capital UK.